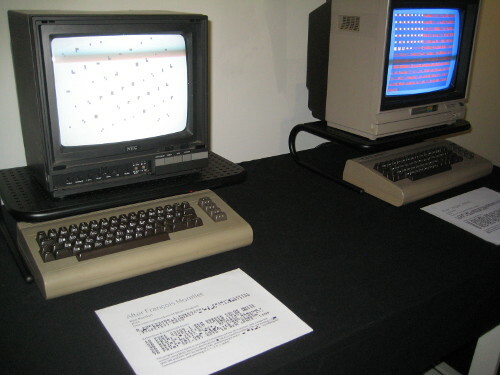 From the “Programs at an Exhibition” exhibit, the C64 BASIC (Montfort) card, and the Perl (Thayer) card – both are being offered for visitors to take. Here’s the Boston.com article on our exhibit “Programs at an Exhibition,” which opens Thursday (March 6). Hope to see you at the opening, which is 6pm-9pm. The exhibit runs March 6 through March 16. Opening: 6pm-9pm, Thursday March 6. Part of the life of remarkable artworks is that they are appropriated, transformed, and made new. In Programs at an Exhibition, two artists who use code and computation as their medium continue the sort of work others have done by representing visual art as music, by recreating performance pieces in Second Life, and by painting a mustache and goatee on a reproduction of the Mona Lisa. 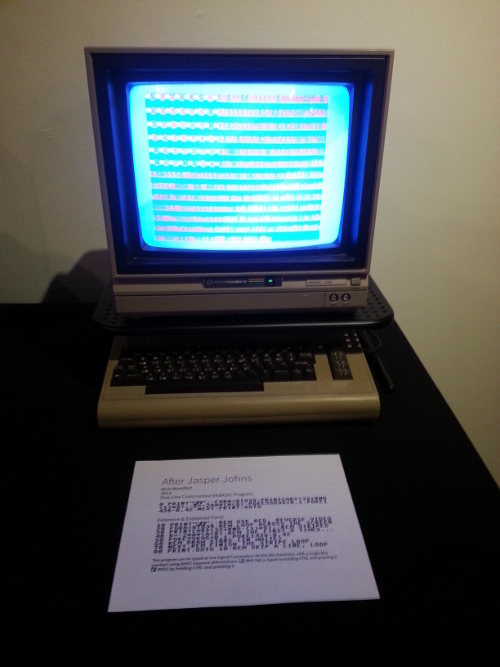 Programs at an Exhibition presents computer programs, written in Perl and Commodore 64 BASIC, each running on its own dedicated computer. The 20th century artworks reenvisioned in these programs include some by painters and visual artists, but also include performances by Joseph Beuys and Vito Acconci. 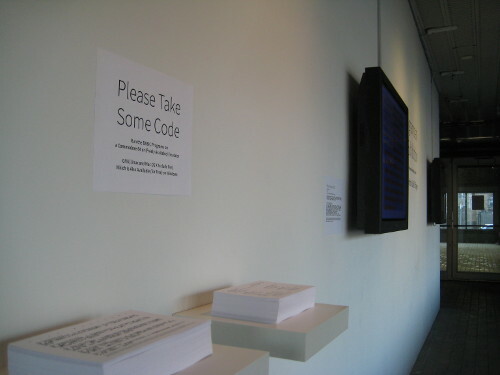 All of the underlying code is made available for gallery visitors to read; they are even welcome to take it home, type it in, and run or rework these programs themselves. The programs (Commodore 64 BASIC by Nick Montfort, Perl by Páll Thayer) re-create aspects of the concepts and artistic processes that underlie well-known artworks, not just the visual appearance of those works. 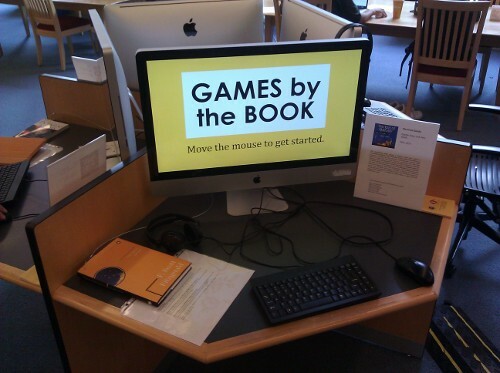 They participate in popular and “recreational” programming traditions of the sort that people have read about in magazines of the 1970s and 1980s, including Creative Computing. Programmers working in these traditions share code, and they also share an admiration for beautiful output. 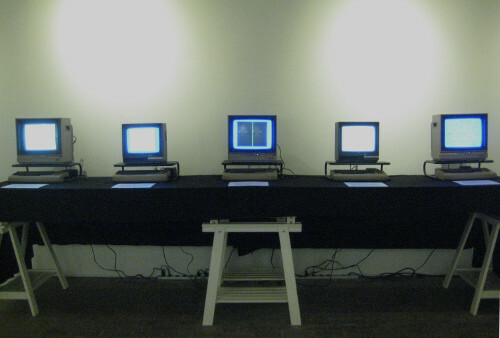 By celebrating such practices, the exhibit relates to the history of art as well as to the ideals of free software and to the productions of the demoscene. By encouraging gallery visitors to explore programming in the context of contemporary art and the work of specific artists, the exhibit offers a way to make connections between well-known art history and the vibrant, but less widely-known, creative programming practices that have been taken up in recent decades by popular computer users, professional programmers, and artists. 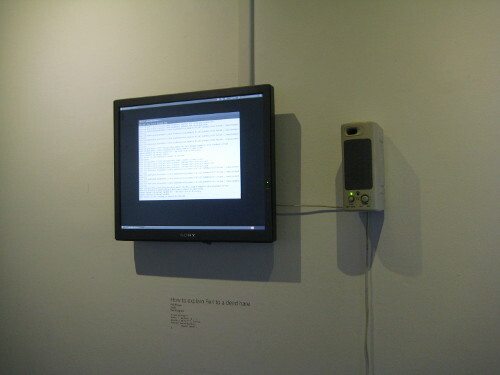 “Páll’s work in Microcodes engages explicitly with the way computer programs are read by people and hwo they have meanings to those trying to understand them, modify them, debug them, and develop them further,” Nick Montfort said. 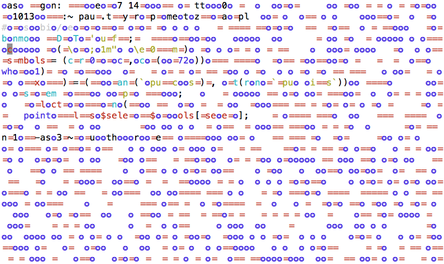 “The Perl programs in Microcodes are quite readerly when compared to my BASIC programs. I’ve tried to engage with a related, but different documented historical tradition — the one-line BASIC program — as it works in a particular computer, the Commodore 64, and to dive into what that particular computer can do using a very limited amount of code, given these many formal, material, and historical specifics. Because my programs are harder to understand, even though they are written in a more populist programming language, I’m including versions of the program that I have rewritten in a clearer form and that include comments.” Montfort’s related projects include a collaborative book, written with nine others in a single voice, that focuses on a particular Commodore 64 BASIC one-liner. 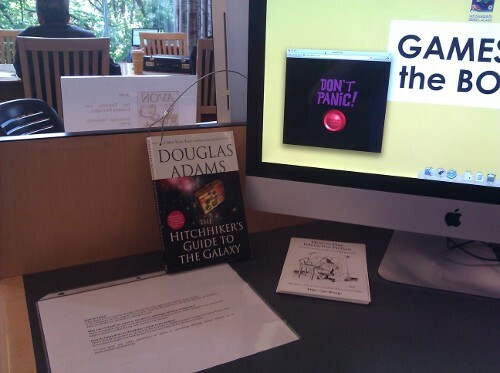 The book, published in 2012, is named after the program that is its focus, 10 PRINT CHR$(205.5+RND(1)); : GOTO 10. Montfort also writes short programs to generate poetry. 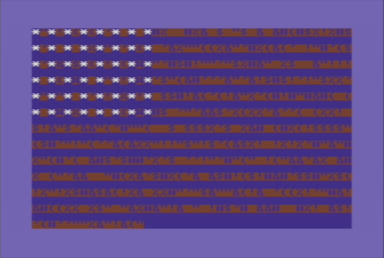 These include two collections of Perl programs that are constrained in size: his ppg256 series of 256-character programs, and a set of 32-character concrete poetry generators, Concrete Perl. His book #! (pronounced “Shebang”) collects these and other poetry generators, along with their output, and is forthcoming from Counterpath Press. I’ll post more on this soon, but for now, let me invite you to the opening of my & Páll Thayer’s show at the Boston Cyberarts Gallery: 141 Green Street, Jamaica Plain, MA 02130, located in the Green Street T Station on the Orange Line, 617-522-6710. The opening is 6pm-9pm on Thursday March 6. 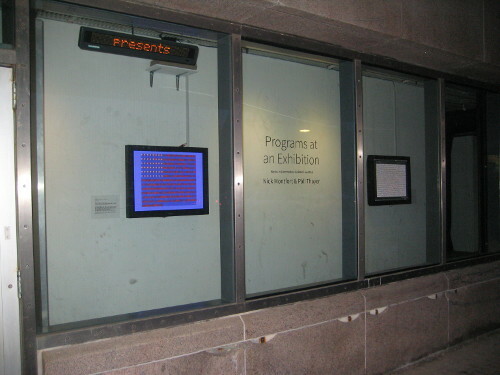 The exhibit (which will be up March 6-16) will feature ten programs (five in Commodore 64 BASIC by Nick Montfort, five in Perl by Páll Thayer), each running on its own computer. The programs re-create aspects of the concepts and artistic processes that underlie well-known artworks, not just the visual appearance of those works. They participate in popular and “recreational” programming traditions of the sort that people read about in magazines of the 1970s and 1980s, including _Creative Computing._ Programmers working in these traditions share code, and they also share an admiration for beautiful output. 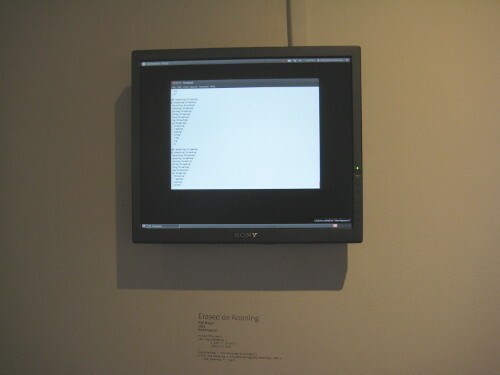 By celebrating such practices, the exhibit relates to the history of art as well as to the ideals of free software and to the productions of the demoscene. By encouraging gallery visitors to explore programming in the context of contemporary art and the work of specific artists, the exhibit offers a way to make connections between well-known art history and the vibrant, but less widely-known, creative programming practices that have been taken up in recent decades by popular computer users, professional programmers, and artists.